The few weeks have been a real struggle for me to keep things together and this definitely starts from my sleeping pattern, my daily routine, my goals and my blog. It’s fascinating how change can come in many forms in our lives and sometimes gradually starts changing everything else, except for the things that we value. The strength of having values is when they are clear to us; our decisions become even clearer. Even though change is often difficult, often it’s also for the best. Accomplishing anything great in life requires significant change that pushes us beyond our comfort zone. When we are willing to step outside of our comfort zone when we need to, that’s when we discover so much more about ourselves, a whole new world - a world of our own vision. My outfit today definitely portrays that change; honestly, wearing faux fur is a big change in my style as well a big step outside my comfort zone. This is the first time I am wearing a faux fur jacket so I didn’t know I was in for a treat - it's the warmest thing ever! Again, wearing leopard print is another big step for me so I really am a step closer to a new vision of discovering new style (if that makes sense!). For underneath and bottom, I went all black, including a black scarf as no one will even notice underneath that big coat. I also thought the leather works quite well with the leopard print. I finished off the look with pair of black boots and my Ray Ban glasses. I hope you like it. 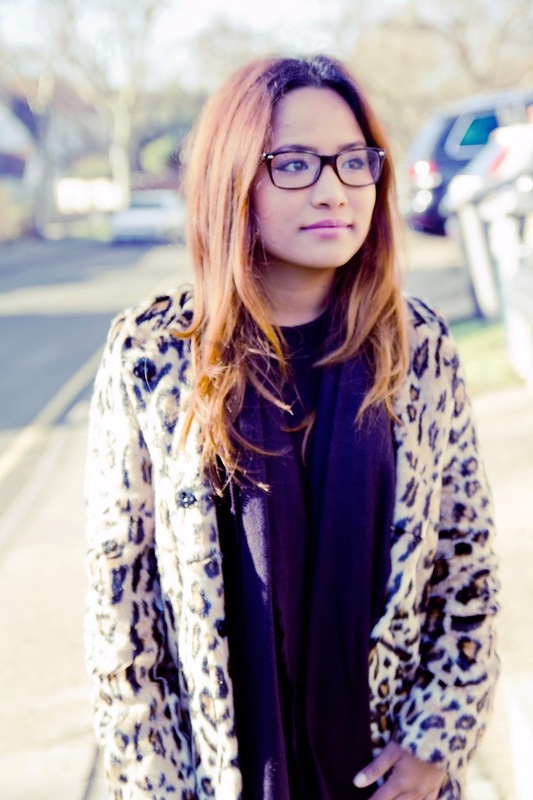 Rocking the leopard print coat! Hi Suzi, I love reading your blog so much so I've nominated you to for the 'Versatile Blogger Award'. It's a great way to increase your followers and grow your blog's presence online. Check out my most recent post to find out what you have to do!